Elite shown in White Diamond Pearl. Elite shown in White Diamond Pearl. With streamlined styling and functional design details, the Passport makes a distinct impression, whether on city streets or in the great outdoors. There’s room for friends and just about anything, with multiple seating configurations, plenty of cargo space and useful underfloor storage compartments. From terrain-tackling capability to all-weekend versatility, see how the Passport does it all. AWD Elite shown in Black Forest Pearl with Honda Genuine Accessories*. AWD standard on Elite, available on Sport, EX-L and Touring. AWD Elite shown in Black Forest Pearl with Honda Genuine Accessories*. AWD standard on Elite, available on Sport, EX-L and Touring. Overcome the elements in the 2019 Passport. Its 280-horsepower* V-6 engine helps you power through, while its torque-vectoring AWD, independent suspension and Intelligent Traction Management system help keep it steady even in adverse road conditions. AWD Elite shown in Lunar Silver Metallic. AWD standard on Elite, available on Sport, EX-L and Touring. AWD Elite shown in Lunar Silver Metallic. AWD standard on Elite, available on Sport, EX-L and Touring. AWD Elite shown in Lunar Silver Metallic. Whether you’re hauling a trailer* or need some extra muscle for a two-lane highway pass, the 280-horsepower*, 3.5-liter V-6 engine is up to the task. AWD Elite shown in Obsidian Blue Pearl. Passport drivetrain and suspension shown. Passport drivetrain and suspension shown. AWD Elite shown in White Diamond Pearl with Honda Genuine Accessories. AWD Elite shown in White Diamond Pearl with Honda Genuine Accessories. Bringing a boat, trailer or dirt bikes along for the adventure? The Passport won’t even break a sweat, with up to 3,500 pounds of towing capacity on 2WD models and up to 5,000 pounds on AWD models*. Elite shown in Lunar Silver Metallic. Elite shown in Lunar Silver Metallic. Roof rails standard on Touring and Elite. Elite shown in Lunar Silver Metallic. Roof rails standard on Touring and Elite. Roof rails add style and can be used with Honda Genuine Accessory crossbars to support up to 165 pounds of gear. Elite shown in Lunar Silver Metallic with Honda Genuine Accessories. Elite shown in Lunar Silver Metallic with Honda Genuine Accessories. Elite shown in Lunar Silver Metallic with accessory running boards. Elite shown in Lunar Silver Metallic with accessory running boards. Cannot be installed with the splash guard set. For those who are going for an extra-rugged look, fender flares add detail to your Passport. Requires roof rails and crossbars. For load capacity information, refer to installation instructions and your vehicle's owner's manual. Requires roof rails and crossbars. For load capacity information, refer to installation instructions and your vehicle's owner's manual. Some components and colors may vary. Please see your Honda dealer for details. Some components and colors may vary. Please see your Honda dealer for details. AWD Elite shown in Black Forest Pearl with Honda Genuine Accessories*. AWD standard on Elite, available on Sport, EX-L and Touring. AWD Elite shown in Lunar Silver Metallic. AWD standard on Elite, available on Sport, EX-L and Touring. Passport drivetrain and suspension shown. AWD Elite shown in White Diamond Pearl with Honda Genuine Accessories. Elite shown in Lunar Silver Metallic. Roof rails standard on Touring and Elite. Elite shown in Lunar Silver Metallic with Honda Genuine Accessories. Elite shown in Lunar Silver Metallic with accessory running boards. Requires roof rails and crossbars. For load capacity information, refer to installation instructions and your vehicle's owner's manual. Some components and colors may vary. Please see your Honda dealer for details. Drivetrain and suspension detail shown. Honda Genuine Accessory trailer hitch shown. With numerous seating configurations, ample cargo space* and hidden storage compartments, the Passport has plenty of room for adventure. So whether you plan your route or prepare for the unexpected, you can load up the Passport to fit your kind of journey. Elite shown in Lunar Silver Metallic. Power tailgate standard on EX-L and above. Hands-free access power tailgate standard on Touring and Elite. Elite shown in Lunar Silver Metallic. Power tailgate standard on EX-L and above. Hands-free access power tailgate standard on Touring and Elite. Elite shown with Black Leather. The Passport boasts over 50 cubic feet of cargo volume* behind the second row—and over 100 cubic feet with the second row folded down—giving you lots of space for just about any kind of gear. In the Passport, even the storage areas have storage areas. 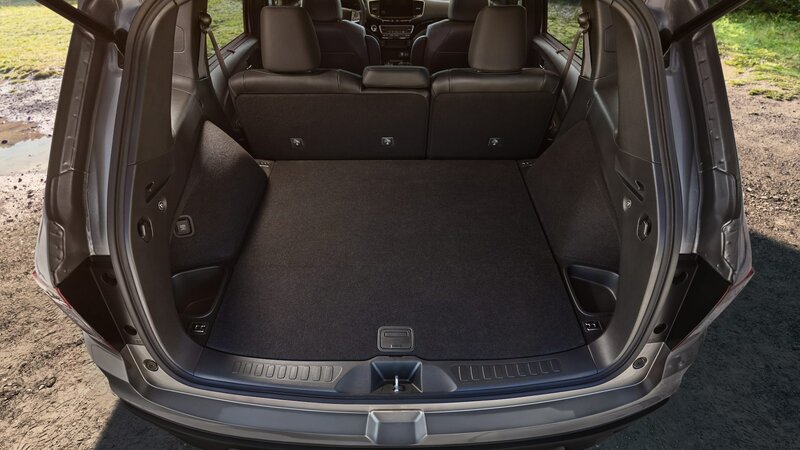 Below the floor panel, you’ll find a spare tire, as well as compartments where you can stow* and organize everyday items, emergency gear and repair tools. The one-touch fold-down 60/40 split rear seatback folds flat to make room for more cargo*. Elite shown with Black Leather. Leather-trimmed seats and steering wheel standard on EX-L and above. Elite shown with Black Leather. Leather-trimmed seats and steering wheel standard on EX-L and above. Elite shown with Black Leather. Illuminated front beverage holders standard on Touring and Elite. Elite shown with Black Leather. Illuminated front beverage holders standard on Touring and Elite. Elite shown in Lunar Silver Metallic. Power tailgate standard on EX-L and above. Hands-free access power tailgate standard on Touring and Elite. Elite shown with Black Leather. Leather-trimmed seats and steering wheel standard on EX-L and above. Elite shown with Black Leather. Illuminated front beverage holders standard on Touring and Elite. Elite shown with Black Leather. Apple CarPlay™ and Android Auto™ integration standard on EX-L and above. Honda Satellite-Linked Navigation System™ standard on Touring and Elite. Elite shown with Black Leather. Apple CarPlay™ and Android Auto™ integration standard on EX-L and above. Honda Satellite-Linked Navigation System™ standard on Touring and Elite. The Passport is loaded with tech for both play and peace of mind. 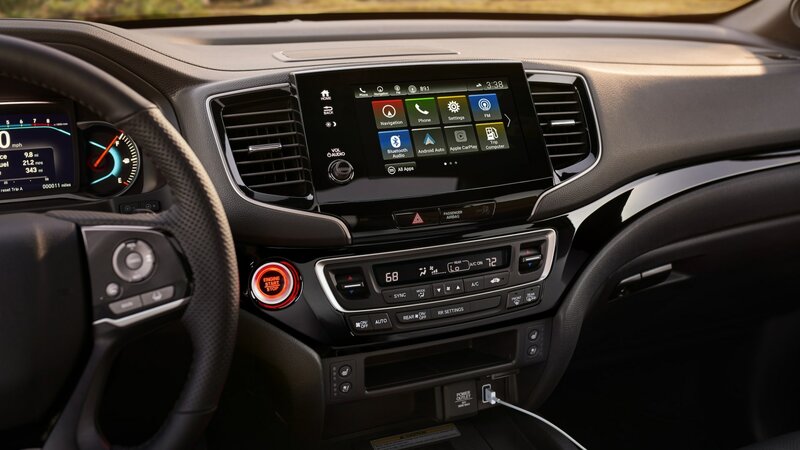 Access your smartphone’s music, messages and more with Apple CarPlay™* and Android Auto™* integration. Or find your way, even off the grid, with the Honda Satellite-Linked Navigation System™*. Apple CarPlay™* and Android Auto™* integration standard on EX-L and above. Apple CarPlay™* and Android Auto™* integration standard on EX-L and above. Elite shown with Black Leather. Wireless phone charger standard on Elite. Elite shown in Black Leather. Wireless phone charger standard on Elite. Just place your compatible smartphone on the wireless phone charger* tray, and an LED indicator will light up to show it’s charging. Elite shown in Modern Steel Metallic. Mobile hotspot capability standard on EX-L and above. Elite shown in Modern Steel Metallic. Mobile hotspot capability standard on EX-L and above. Enjoy wireless streaming capabilities, including audio system updates, by turning your Passport into a mobile hotspot* with an available data plan from AT&T. 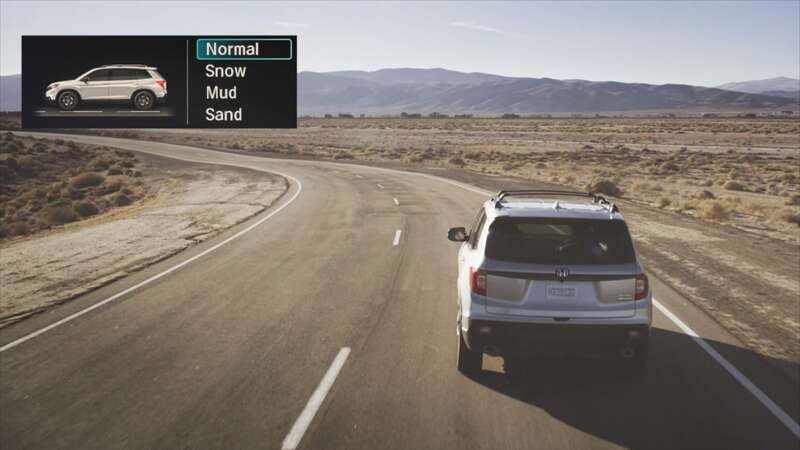 Honda Satellite-Linked Navigation System™ standard on Touring and Elite. Honda Satellite-Linked Navigation System™ standard on Touring and Elite. The Honda Satellite-Linked Navigation System™* features 3-D renderings of terrain, buildings and road signs, as well as lane guidance. And because it uses a preloaded map database and satellite connectivity, it even works in off-the-grid areas. HondaLink® Subscription Services standard on EX-L and above. HondaLink® Subscription Services standard on EX-L and above. Connect to your compatible device with the HondaLink®* app to find your car, view your fuel range and schedule service appointments. Second-row USB ports standard on EX-L and above. 115-volt power outlet standard on Touring and Elite. Second-row USB ports standard on EX-L and above. 115-volt power outlet standard on Touring and Elite. One-touch power moonroof standard on EX-L and above. One-touch power moonroof standard on EX-L and above. Elite shown with Black Leather. Heated front seats standard on EX-L and above. Heated outboard rear seats standard on Touring and Elite. Ventilated front seats standard on Elite. Elite shown with Black Leather. Heated front seats standard on EX-L and above. Heated outboard rear seats standard on Touring and Elite. Ventilated front seats standard on Elite. With heated front and outboard rear seats, as well as ventilated front seats to help you stay cool, the Passport will keep you comfortable any time of year. Driver’s seat with 10-way power adjustment, including power lumbar support and two-position memory standard on EX-L and above. Driver’s seat with 10-way power adjustment, including power lumbar support and two-position memory standard on EX-L and above. Elite shown in Lunar Silver Metallic. Heated side mirrors standard on EX-L and above. Auto-dimming, power-folding side mirrors standard on Elite. Elite shown in Lunar Silver Metallic. Heated side mirrors standard on EX-L and above. Auto-dimming, power-folding side mirrors standard on Elite. Elite shown in Lunar Silver Metallic with accessory fender flares. Elite shown in Lunar Silver Metallic with accessory fender flares. After you park and shut the doors, just walk away from the Passport with the key fob and Walk Away Auto Lock® will lock it automatically. With Smart Entry, when you come back, you can unlock the Passport just by grabbing one of the front-door handles. When you put the Passport in reverse, the multi-angle rearview camera* lets you choose from three angles—normal, top-down and wide—for a better view as you back up. Elite shown in Modern Steel Metallic. Blind spot information (BSI) system with cross traffic monitor standard on EX-L and above. Image enhanced for demonstration purposes. Elite shown in Modern Steel Metallic. Blind spot information (BSI) system with cross traffic monitor standard on EX-L and above. Image enhanced for demonstration purposes. The blind spot information system* can detect and alert you to the presence of other vehicles to the side of your Passport. Elite shown in Modern Steel Metallic. Blind spot information system with cross traffic monitor standard on EX-L and above. Image enhanced for demonstration purposes. Elite shown in Modern Steel Metallic. Blind spot information system with cross traffic monitor standard on EX-L and above. Image enhanced for demonstration purposes. The blind spot information system* also includes cross traffic monitor, which can alert you to approaching vehicles detected when you’re backing up. Elite shown with Black Leather. Apple CarPlay™ and Android Auto™ integration standard on EX-L and above. Honda Satellite-Linked Navigation System™ standard on Touring and Elite. Apple CarPlay™* and Android Auto™* integration standard on EX-L and above. Elite shown with Black Leather. Wireless phone charger standard on Elite. Elite shown in Modern Steel Metallic. Mobile hotspot capability standard on EX-L and above. Honda Satellite-Linked Navigation System™ standard on Touring and Elite. HondaLink® Subscription Services standard on EX-L and above. Second-row USB ports standard on EX-L and above. 115-volt power outlet standard on Touring and Elite. One-touch power moonroof standard on EX-L and above. Elite shown with Black Leather. Heated front seats standard on EX-L and above. Heated outboard rear seats standard on Touring and Elite. Ventilated front seats standard on Elite. Driver’s seat with 10-way power adjustment, including power lumbar support and two-position memory standard on EX-L and above. Elite shown in Lunar Silver Metallic. Heated side mirrors standard on EX-L and above. Auto-dimming, power-folding side mirrors standard on Elite. Elite shown in Lunar Silver Metallic with accessory fender flares. Elite shown in Modern Steel Metallic. Blind spot information (BSI) system with cross traffic monitor standard on EX-L and above. Image enhanced for demonstration purposes. Elite shown in Modern Steel Metallic. Blind spot information system with cross traffic monitor standard on EX-L and above. Image enhanced for demonstration purposes. Elite shown with Black Leather. Wireless phone charger* standard on Elite. Elite shown with Black Leather. Wireless phone charger* standard on Elite. Cargo area 12-volt power outlet standard on EX-L and above. Cargo area 12-volt power outlet standard on EX-L and above. With Passport, each trim level builds upon the one before it, giving you more features and upgrades as you go. See how the Passport stacks up against the competition. 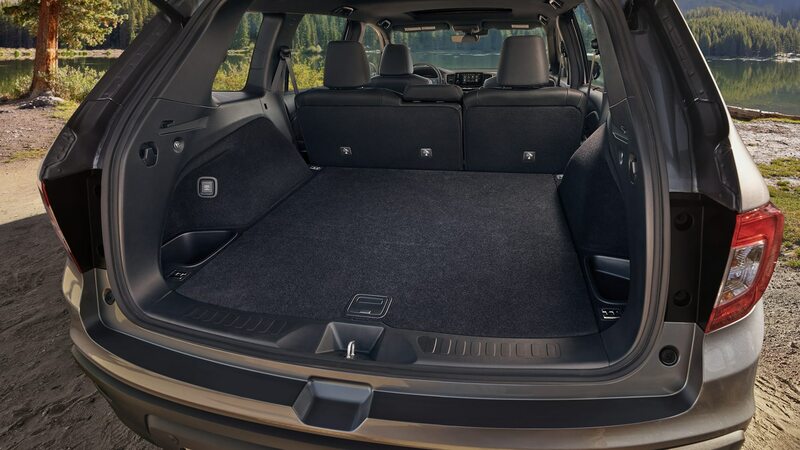 With best-in-class interior cargo space and innovative features that come standard, the Passport has a clear edge over the Grand Cherokee. See how the Passport compares to other SUVs in terms of performance, features, specs and overall value.